Q. With the ever increasing costs associated with trade show exhibiting ,how do you dramatically increase your rate of return? 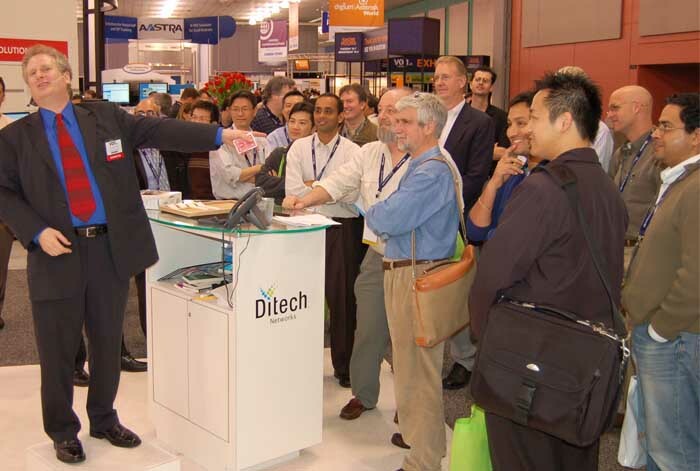 A. David Levitan, tradeshow magician. Cloaked in an atmosphere of fun and excitement, David delivers a custom-scripted presentation that is guaranteed to stop traffic, draw tremendous crowds, and qualify leads on the spot. Educate Tremendous Crowds. David seamlessly weaves your product information and entertainment into a powerful sales tool. His magic holds the crowd but your company and its products are the star of the show. His presentations run approximately 12 minutes in length and are repeated 2 times per hour. The booth becomes full of customers and your sales staff has ample time to educate qualified attendees with more specific details. David is one of the world’s leading trade show presenters. His style will always reflect your corporate image. He is your ambassador of good will and an excellent representative of your company. Time and time again he has doubled, tripled, and even quadrupled his client’s qualified leads. Have David create his “Sales Magic” for your company. Here are just a few letters from David's Clients. You may not realize it, but we have now partnered with you for more than a year to generate thousands of leads at more than eight trade shows throughout the U.S. We look forward to working with you again at the N+I and PC Expo this spring. To date, the results have been great. We want to thank you for your flexibility and creativity in promoting a very technical product line. Your talents have helped us increase the quality of the leads we have generates and significantly increased our booth traffic. you have seemlessly intergrated act with our sales staff and we continue to receive positive comments from them at every show. It makes such a difference to work with creative people who can work well with a large trade show team. I wanted to make sure you knew how much I appreciate your ability to "stay on message" with scripts that we provide. Again, thanks for helping make some of our lead generation challenges "disappear!" I look forward to seeing you in May. 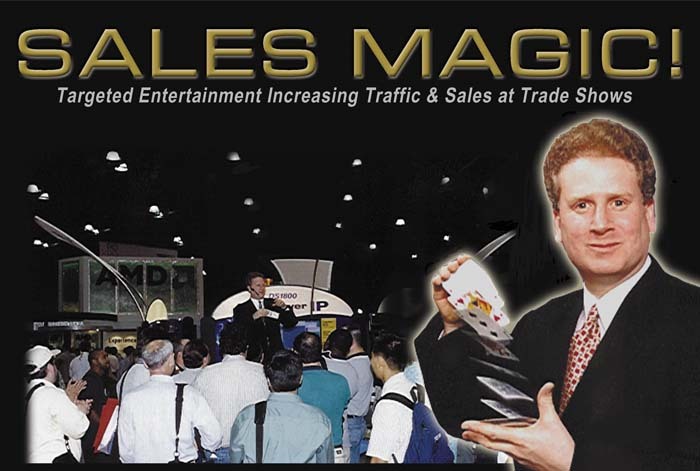 I'd like to take this opportunity to thank you for doing such a terrific job for Magic Solutions at our last six trade shows. We can always count on you to drive traffic into our booth. While competitors' exhibits were virtually empty at times, our booth was always filled with prospects--thanks, in large part, to your entertaining material. In addition tp perfroming an amazing array of magic tricks, you handle the technical information about our software products with great ease and confidence and with very little notice, you can always be relied u[pon to incorporate new product information seamlessly into your presentation. You represent our products so well, in fact, that I am often asked if you are really part of our sales team! On behalf of everyone at Magic Solutions, thank you for exceeding our expectations over the past two years with your talent, enthusiasm and professionalism. We look forward to working with you at trade shows in the U.S. and Europe in the years to come. On Behalf of Monsanto and myself I want to thank you for your work at the Greens Industry Expo, in Charlotte, NC. Your magic shows dramatically increased booth traffic and left show attendees with a fun and lasting impression of Monsanto products. I though you did a great job weaving our product messages into the show. It was very natural, and sounded like you knew what you were talking about. Several attendees commented to me after your shows that they thought your show was a great way to get people in the booth and informed about Monsanto products. We look forward to working with you in the future. Thanks you again for your great work. I just wanted to take this opportunity to thank you once again for your fine job during this year's CMA (Communication Manager's Association) Trade Show. By taking the time to learn our business, products, and services, and intergrating them into your exceptional show, you accomplished the very difficult task of attracting countless prospects. We look forward to working with you again at future shows. Once again you have kept our Trade Show booth filled with qualified attendees. your ability to seamlessly incoroporate product information and slight-of-hand magic is astounding. I must admit I had reservations four years ago about having a "magician" delivering complicated technical data, but after twenty five successful trade shows "I Believe !" Our sucess at shows such as Comnet, Networld Interop, BICSI, and CES is in no small part due to you and your innovative talents. You should be proud to know that you have incresed our qualified lead list by over 400%. You can be sure that when we are preparing fo future shows, David Levitan will always be on top of the check list. In addition to pulling in nearly as many leads in the first day as we got during the entire DAC show the previous year, Dave Levitan was a wonderful magician and consummate professional in every regard. He never failed to glide through our complicates terminology as if it was the most everyday and relevant subject matter on the planet. On the strength og his entertainment, nearly everyone who stopped also moved into our booth to stay and hear our technical presentation. With the pre qualification built into his routine, we were able to identify our hot leads and give themspecial treatment. He was fresh every single time, and sounded incredibly natural rolling out our long and complex messaging. And he never took kto long for lunch. Thanks again for your hard work at the AIIM conference last month. Our entire team was impressed with your ability to understand our solutions and seamlessly blend our marketing pitch into your performance. At the 2010 AIIM Expo, we increased our leads by 200% from the previous year, a jump which we largely attribute to your inclusion at our tradeshow booth. Beyond the increased volume in leads, you were able to excite the attendees with not only your performance, but our product offerings as well. On behalf of Eastman Kodak Company, I would like to again say thank you for the outstanding job that you did for us at the ARMA show in San Antonio, TX. David, you are a true professional and a joy to have in the booth with us! The way that you assisted us in bringing customers not just with your tricks, but even when you were't on was great... you are a true team player! Your easy going style and way with people is a great asset...and your mind reading/magic skills ain't so shabby either! i still want to learn how to turn $100 dollar bills into $1000! I am really glad that the enitire marketing team was there to experience your skills. This is the first time i can remember all of us actually agreeing on something in a positive way! As you know, based on our experience and disscussions, we have hired you for our Breakaway Conference to work with our channel partners and we are discussing ways we can incorporate you into other events for next year. The team really enjoyed having you there with us. Congratulations, you are now an official member of the Documents Imaging Trade Ahowa R Us team! Thanks again David...good luck to you with your future adventures and I look forward to working with you again next year. I will be in touch soon. Thank you for contributing to the sucess of Quest Software's participation at Oracle Open World in San Francisco. Our success is due in part to your tireless efforts and skills as our official "booth magician." The attention you drew to our booth followed by your entertaining magic act assisted us in our large volume of lead generation and attendee awareness about Quest. Your ability to work with large crowds was especially helpful during our grand prize raffle where we relied on you to entertain a crowd of 1000+ people. Thank you for your trade show expertise-you definitely enhanced our booth!